Courtesy of WikiCommons, this 1908 postcard of the seemingly immutable South Station also shows the Atlantic Elevated (running up the right side) that connected South and North Stations in a Bostonian roundabout way… until it was torn down in 1938. The consequences of not integrating the two central stations are many and show how badly transportation is governed… in even a good government state. In the Big Picture, poor connections hamper train service to the three northern New England states (Maine, New Hampshire and Vermont); isolating them ‘de facto’ from transportation alternatives. A modern federal standard should require the efficiencies of through-service. Of more immediate concern, MBTA commuter rail ridership peaked in 2006 at 141,000 weekday trips and has dropped about 10% … despite the region growing about 8%. With those numbers going in opposite directions instead of rising together, road congestion worsened. Couple that with urban transit at peak hours continuing to over-crowd. Transit is a less attractive option when it should be more of an alternative to counter the costs of car commuting. Despite the state’s knowledge of all this, it seems powerless to stop this negative multiplier effect; in part because its policies are biased to cars. For example, it has built several tunnels to bring cars downtown; the last major one being the notorious Big Dig. Yet, a tunnel to unite two train systems into one network has been an obvious solution for decades. Under current law, Massachusetts is responsible for ignoring the obvious. New laws must rebalance authority so transportation progresses. With persistence from former Governor Michael Dukakis, a civic coalition organized to support this new tunnel. Their case for how the tunnel can unify the system is made on their website. (Offering a comprehensive solution and using examples of game-changing tunnels made by America’s economic competitors, this website is a model for other civic groups seeking solutions.) Despite the economic and social benefits for this North-South Rail Link, the NSRL faces delays (mostly from the state), added costs and possible interference from MassDOT’s intent to use a nearby postal facility to expand South Station. In my view, NSRL is the strategic accelerant… perhaps a multiplier for train modernization in New England. Yet, the state has not committed to modernizing its trains; whether it is hybrid electrification or even uniform boarding platforms. A solid modernization is proposed by Transit Matters’ excellent study Regional Rail for Metropolitan Boston. (Boston is the only metro I know of that has two civic groups producing high-quality transit proposals.) Read the report’s details. But, the key issue is that state dithering raises the price to taxpayers for all aspects of modernization. Worse is how state dithering reduces revenue. 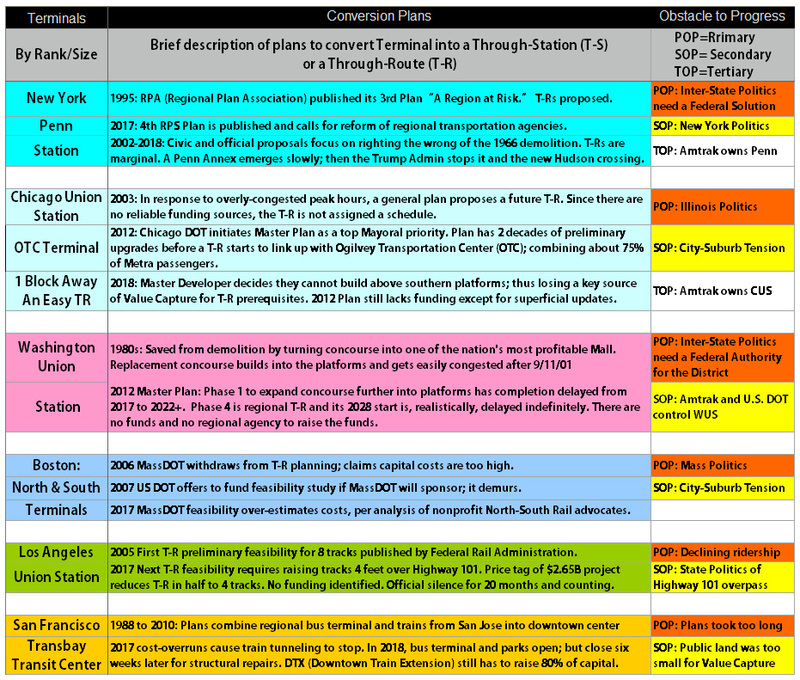 MassDOT’s unclear policy dampened a decade of serious plans to build above Boston’s three main stations (South, North and Back Bay) using their air rights. Other significant property tax revenue (which could help fund the train tunnel) is lost because state support for a through-route is not reliable. Failing to modernize and unite the two systems suppresses property value growth near main stations because nearby buildings are less convenient for shoppers and employees. There is a similar suppression around the metro’s other larger stations. Chapter 9 details how even a competent state DOT cannot make a tunnel a mere 1.6 miles long despite the multiple benefits of uniting the two systems, improving commuter options and unleashing transit’s support for property redevelopment. By keeping trains constrained within 19th Century terminals, trains cannot contribute to other social solutions; such as TOD land use patterns to help reduce Boston’s shortage of affordable housing. While the region needs to innovate its governance, the related core obstacle of a new deal to modernize is the difficult dynamic created by Boston transit users. When their service goes bad, the colorful complaints have few rivals across the nation. When Massachusetts finally tries to improve service with a fare increase, complaints escalate. With no one liking the old deal, the cobbled condition of Boston transit resists real solutions. However, we need to recognize that colorful complaints are really a reaction to too-tight state control of transit agencies. It is time for Massachusetts to loosen its grip. To start resolving such a state of distrust, perhaps we actually can make something of Trump’s infrastructure proposal. Ideological and possibly designed to postpone solving commuter problems, Trump’s proposal would make states pay way more than they ever could. But, Trump really only accelerates a trend for much of this century. In laying bare the real decline in federal funding, Trump actually creates opportunities for overhauling how we govern transportation. Since Boston has such high land values and can afford the capital costs required of better transit, they should propose an alternative deal in which the metro pays for more but also gets the authority to modernize transit. But no body wants to pay for transit under the current regime. So, consider offering taxpayers a new deal that goes something like this: if the metro were given taxing and usage fee authority to raise money and improve transportation, then Massachusetts would not have to pay the 70-80% as Trump proposed… or not even the 30% it probably pays today. In structuring this deal correctly, the state in theory could pay as little 0% eventually. But for this to ever happen, the state must give up authority so the metro can solve problems. To do its job, the agency needs Uncle Sam’s authority and bonding to organize private partners. In this new deal, there must be a believable promise to taxpayers that a rail tunnel connecting North and South Stations won’t end up ridiculously over-budget and poor quality …. as was Boston’s Big Dig (which, evidently, is still stuck in the civic craw.) In brief, a NSRL-like tunnel and other supporting train upgrades really need a civic campaign that promises a new deal selling the benefits of a true transit alternative to cars… and, more important, an agency that can deliver. Only then can Boston break its cycle of colorful complaint. That deal is only believable from an elected, accountable regional agency. More of its details are developed in the chapter. Moving U.S. Forward. The rationale for Uncle Sam helping the Boston and DC/Baltimore metros is clear: their through-tunnels are infrastructure of strategic federal importance. Better yet, these tunnels test methods to overcome two fundamental flaws in federal domestic policy. The first is a federal failure to prototype. There are too many examples of Congress passing laws and requiring all cities to follow them before we even have results to know if it is a good law that the next generation can afford. Pick your example of policy: public housing, interstate radials encouraging sprawl and segregation of uses. All created multi-decade mistakes; avoidable if policy had been prototyped so consequences could be known and adapted for. The second policy failure is when Congress dumps responsibilities on states and they are the wrong size to solve local problems. With the feds wiggling out of their traditional 80% capital costs and Trump whittling the wiggle radically further, states — increasingly insolvent — have their largest incentive in history to right-size transportation authority to metros. This evolution needs a bump from U.S. law and funding incentives. This includes structuring a new deal of accountability to local taxpayers and commuters who will pay the new costs. Focussing federal power should end the repeated false starts and different levels of government sabotaging something as fundamental as replacing the Hudson Tunnel that connects the world’s largest financial center to the rest of the country. This initial federal rationale also includes national security: such as modernizing and protecting the tunnel that runs through the Capitol grounds to Virginia. In our toxic and irrational politics, we will need to mollify advocates of states rights currently ruling the roost. But what shapes a deal over the next decade is to let states off the hook for funding the impossible burden proposed in the Trump plans. Since the 1980s, the federal trend of sticking states with obligations they cannot afford nor solve is a lose-lose for everyone. With many states in imminent insolvency, we have a chance to restructure transportation so each metro can raise the funds it needs to solve its congestion. Uncle Sam reducing his share of funding (the carrot.) In return, an effective deal must give the force of enough federal law (the stick) so each metro can raise missing capital and to modernize the service for commuters so taxpayers get value and private operators at least come out whole. For that, a metro agency must increase operating revenue by rebalancing the economic choices between cars and transit. This Preview just outlined the differences in solutions for Boston, Baltimore and DC. Details in their chapters use Uncle Sam to smooth the required power transfer from states to metros. The New York metro has similar problems, but needs its own Preview to explain its slightly more complicated deal… which includes using the President’s Bully Pulpit to achieve progress. Late April’s Preview: The Politics of Drawing Lines. The map above is a collaboration synthesized by two top American experts in regional rail. In 2009, Alon Levy wrote two articles for “The Transport Politic.” This schematic brings synergy to three separate rail systems. Consider this as New York’s multiplier for train modernization. Despite current law forbidding such economic logic, drawing two simple through-routes, theoretically, helps prepare Big Apple trains for the 21st Century. Pivotal. One through-route tunnels from Grand Central Terminal to Penn Station (10 blocks.) Its capacity-building potential has been well-known for this century. The second line connects Atlantic Terminal and Hoboken with a stop at the Fulton subway hub in the financial district. (Admittedly, this inter-modal multiplier is longer, a six mile tunnel.) But, NYC must relieve peak hour stress on its aged subway. Through-routed commuter trains remain the most effective solution to this metro’s particular geographic — and political — transportation challenges. Those who run the metro’s tri-state byzantine transit agencies never got the above memo, or independent expert thinking or even the drawing. Or at least, they never considered these solutions seriously; particularly since there were tensions (typically derived from national ambitions) between the Governors to whom these Authorities owe their jobs. Nor in the nine years since the lines were drawn could these divergent Boards start integrating three large systems. While this misalignment of authorities prevents efficient solutions, even current service is threatened increasingly by crisis. That crisis now looms close with Trump’s intent to block the update of the Hudson Tunnels by reducing the USDOT’s 50% contribution. This 50% was a deal made by a previous Congress and Administration. Already stressed at 25% each, New York and New Jersey must think outside the box that policy has trapped them. In this context of dysfunction and broken deals, the NYC Preview (due to post in late April) explores how this mega-metro can restructure its affairs so politicians do not sink, yet, a fourth plan in sixteen years to replace these Tunnels. Protecting the nation’s financial center from a transportation catastrophe must start now. Even if USDOT were to honor their 50% commitment (and the courts probably will force this), the Tunnels would not be replaced until 2026 at the earliest. Since there were three Nor’easters this past March, each one that hits the Hudson increases the chances this new tunnel would not be completed before the aged 1908 inheritance becomes unusable. Uncle Sam will come to the rescue; but not with a moneybag to fill the gap. Rather, we must evolve a federal intent to shape 21st Century metropolitan policy of which transportation is key. The Final Preview: Overcoming The Weak State. Chicagoland is blessed: it doesn’t even need a tunnel to connect its two adjacent terminals to start developing a higher capacity commuter through-network. Amtrak already through-runs on the edge of the Chicago River. Its two tracks merely need to be doubled and shared with commuters. But such blessed simplicity is also damned by Illinois being flat-broke and piling-up two decades of deferred maintenance; including rail-cars built in the 1970s. Far worse, ten commuter lines are not electrified; ignoring global standards. Such neglect, not surprisingly, diffuses the key goal of using trains as an economic multiplier. Chicagoland labors inefficiently while new taxes go to pay past bills instead of investing in the future. Damned. As salvation, this metro may be the most ripe for a new deal with its solitary state. This chapter proposes a deal that Illinois cannot refuse; given its debilitating chronic fiscal mismanagement. Concluding Moving Forward. These last two previews will describe the nation’s two worst stations and why they only can be updated to a global standard if Uncle Sam is a true partner in re-delegating state transportation authority to the metropolis. For these and most legacy systems, it is at the metro level where policy can develop the land use subtleties required to reduce road congestion and household mobility costs. These are two key rationales for government moving us toward more sustainable transportation policies. Let’s get the prototypes right. Next Next post: Preview F: Penn Station And The Hudson Tunnels….. Are We Ready To Start Testing The 21st Century Standard For Regional Rail ?